Here’s a Stomp sneak peek with a great live performance from Sugar Pie Desanto when she toured Europe as part of the American Folk Blues Festival. Ponderosa Stomp alum Hubert Sumlin is on guitar! Below is snapshot of Sugar Pie’s Ponderosa Stomp poster- from the letterpress geniuses at Yee Haw Industries. 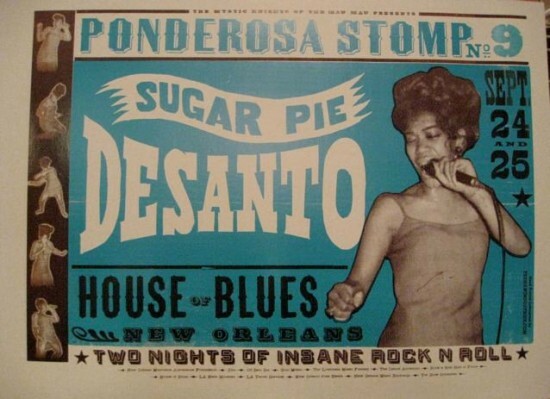 See Sugar Pie Desanto live and snag her poster on at the Ponderosa Stomp in New Orleans on September 24th and 25th, 2010. Barbara Lynn, the Empress of Gulf Coast Soul, will be performing with Lil Buck and the Top Cats on June 5th, 2010 at the Rock N Bowl. Presented by the Ponderosa Stomp Foundation and the Rock N Bowl.